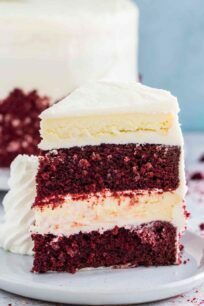 Red Velvet Cake Cheesecake made with layers of creamy cheesecake and red velvet cake covered in cream cheese frosting, it's perfect for Valentine's Day or any other special occasion! Spray 2 8-inch cake pans with baking spray, cover the bottom to fit with parchment paper and spray again with baking spray. Set aside. In a medium bowl combine dry ingredients: flour, sugar, baking powder, baking soda, salt, and cocoa powder. Whisk to combine. Set aside. Add wet ingredients to a large bowl: eggs, oil, buttermilk, vinegar, vanilla extract, and red gel food coloring. Using a hand mixer (or stand mixer), whisk on medium speed until fully combined. Bake, rotating the pans halfway through the cooking process until a toothpick inserted into the center of the cakes comes out clean, about 30 minutes. Remove the cakes from the oven and run a knife around the edges to loosen them from the pans. Let it cool in the pans for about 20-30 minutes. Invert the cakes onto a plate and then re-invert them onto a cooling rack. Round side up. Cool completely before frosting. Spray 2 8-inch cake pans with baking spray, cover the bottom to fit with parchment paper. Set aside. Add salt, vanilla extract, and sour cream and beat until mixed through, stopping to scrape the sides and bottom of the bowl with a spatula. Divide the cheesecake batter equally into the prepared pans. Level the tops with a spatula. Transfer the cake to the preheated oven and bake it for 40-45 minutes. The cheesecakes should be just slightly wobbly in the center, but puffy and settled on the sides. Turn off the oven and crack open the door. Cool cheesecakes completely in the open oven. Prepare the Cream Cheese Frosting per recipe directions. Start with a cake stand and place a cardboard round cake paper on top. Add 1/3 cup of frosting and spread it. Level its layers using a cake leveler or a sharp serrated knife. Place one layer on the cake stand. Add 1/3 of the frosting and spread it in an even layer. Level the cheesecake layer, using a sharp serrated knife, level the edges. Place it on top of the frosting layer. Repeat with the remaining layer and another cheesecake layer. Use the remaining frosting to cover the cake entirely. Add cake crumbs to the edges of the cake. Chill it for two hours before serving, for the frosting to set.